Harga dia x der mahal sangat, jgn takut, cuma $32.99USD ajer. This new USB Mini Fridge and Heater looks like a traditional fridge and will keep your drink cold, or your cup of coffee warm. No word on pricing. 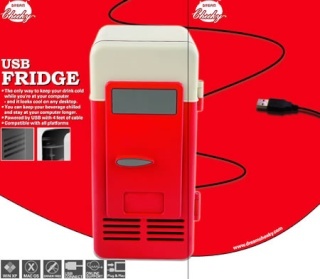 * This USB mini Fridge and Heater is the only way to keep your drink cold/warm while you’re at your computer and it looks cool on any desktop. * You can keep your beverage chilled or warmed and stay at your computer longer. * Blue LED lighting effects. * Cooler or heater function switch. * Easy installation, no driver required, plug & play. * Powered by USB with 4 feet of cable.